So you’re probably wondering what e-liquid is all about! What does it contain? Is it safe to use? Are there any side effects? And maybe you have many other thoughts that pass through your mind in order to clarify any justification before you decide to start using an electronic cigarette device. Here we will aim to outline any queries and concerns you may have regarding the usage of e-liquid and Electronic Cigarettes. So let us first start with the name E-Liquid, which is a term used to signify that the liquid content is to be used in conjunction with an appropriate electronic cigarette device, hence the first letter being ‘E’ . There are some other terms used instead of e-liquid, some of which are e-juice and smoke-juice. So what does E-liquid contain? Flavours and nicotine are dissolved in hygroscopic (absorbs water from the air) components, which turn the water in the solution into a smoke-like vapour when heated. Commonly used hygroscopic components include propylene glycol, vegetable glycerine commonly known as PG and VG. Both liquid bases are common food additives used in a variety of pharmaceutical formulations. Propylene glycol, the current dominating liquid base, has been utilised in asthma inhalers and nebulizers since the 1950s, and because of its water-retaining properties, is the compound of choice for delivering atomized medication. The main prominent base fluid of e-liquid tends to be Propylene Glycol (PG) or it can also be Vegetable Glycerine (VG). Contents of the e-liquid solutions vary, but their common aspects include water and flavourings in a propylene glycol or glycerine base. Nicotine is also included in solutions intended to fulfil a nicotine replacement role. PG or VG liquid is used as the carrier to provide the nicotine to the user; however users also can use electronic cigarettes with zero nicotine content e-liquid. The base fluids produce the smoke simulations visible when used with an appropriate electronic cigarette device. Hundreds of different flavour varieties are available from food and drink, domestic and exotic fruits and a range of tobacco emulating flavours. All flavours are subjective, and each person will have a subjective experience of the taste. Generally tobacco flavours or those that aim to mimic tobacco brands are still a stretch away from having the same flavour as a traditional tobacco cigarette brand, but still effectively offer the user a similar flavour that as well as being reasonably compatible, also offers the simulation of a great throat hit, and plumes of vapour plumes whilst simultaneously delivering the desired nicotine to the user. Liquid solutions containing nicotine are available in differing nicotine concentrations to suit user preference. Our Liquids are available in 0mg-3mg-6mg-12mg-18mg-26mg strengths. Please read ‘Safe Usage’ below for your information. We make our E~Juice in house and have searched for the best quality ingrediants ensuring that our E~Juices are top quality and deliver plenty of flavour and vapor. The health effects of using electronic cigarettes are currently unknown. Several studies regarding the long-term health effects of nicotine vapour, both inhaled directly and second hand, are currently in progress, although it should be noted that second hand side stream smoke is non-existent due to on-demand operation and that vapour is generated rather than smoke. A typical traditional tobacco cigarette will supply the user on average around 15 inhalations; this would be termed as 15 puffs of inhalation in the e-cigarette world. So typically, 15 puffs on an electronic cigarette device is approximately equivalent to one traditional tobacco cigarette in comparison. There are however many factors that would be taken into consideration, to calculate the exact relative nicotine consumption, some of which is the nicotine strength of your e-liquid which may come in a range such as 9mg, 12mg, 18mg and 24mg, also the flavour, type of atomizer/cartomizer used and not to mention the actual amount of nicotine the body absorbs upon each puff. There are varying reports indicating what amount of nicotine the body actually absorbs, some studies claim only 10% of nicotine is actually absorbed by the body, whilst other reports claim, 50%, 60% and even 80%. Everyone smokes tobacco cigarettes differently in different circumstances. Have you ever really counted how many puffs it takes to finish a cigarette? How about when you’re driving? When you’re talking? When you’re drinking coffee? When you’re outside smoking? Electronic cigarettes don’t burn away. They only produce vapour at the user’s request. A tobacco cigarette depends on the situation. The numbers have been rounded slightly here to make them easier to work with. No scientific studies have actually been performed with regular users of e-cigarettes to determine how much of the liquid nicotine, if any, is burnt up or evaporates before it hits the lungs. Therefore, the numbers represented above indicate the maximum amount of nicotine intake assuming that 100% of it makes it into the lungs of the user of an electronic cigarette. For every 15 puffs (typically comparative to a tobacco cigarette) a 24mg,18mg and 12mg nicotine content would supply the user, respectively 1.5mg,1.125mg and 0.75mg of nicotine, and this is also taking into consideration that these amounts would be 100% absorbed by the body upon vaporised inhalation. It should also be noted that, although nicotine is highly addictive, no studies have shown nicotine to be a carcinogen. It is simply “the fix” that cigarette smokers crave. It is recommended that those who have a demonstrated sensitivity to nicotine, are pregnant or breastfeeding or who have unstable heart conditions, should discuss the use of any nicotine delivery device with a doctor before using. Over time, when a user of an electronic cigarette becomes accustomed to vaping, a user may decide to slowly and gradually decrease the e-liquid’s nicotine strength. One may find it more effective only to start decreasing the nicotine levels once you one is totally free from tobacco cigarettes. Some users really enjoy vaping and also the flavours, and do not have a desire to quit vaping. Others may utilise e-cigarettes specifically with an aim to put an end to their nicotine dependency. Many users may have successfully quit tobacco cigarettes altogether. Whichever one chooses, it’s ultimately up to the user to their own choice. If your goal is to quit, then one may try setting oneself a goal to lower the e-liquid nicotine content gradually, week by week till one is finally smoke-free. Some may require a big nicotine hit in the mornings, and much less during the night time. So you could possibly have two options: vape less at night, or have e-liquids with different strengths at hand (i.e.. you might use an 18 mg during the day and 12 mg at night before bed), one is able to adjust their usage to their own comfort. According to medical professionals, if you smoke a lot before you go to bed, you may not sleep well. However for others it may have zero effect on their sleeping pattern. How Long Does the Transition to E-cigarettes Take? Again, how long it takes for you to be totally free from smoking and to be comfortable with electronic cigarettes can vary. For a lot of us, we make the switch in one day and have an occasional tobacco cigarette on social occasions, that’s about it. It may vary for you. It can really be easy for some, whilst others may stagger or gradually switch over. Ideally the best method may be to totally switch over, allowing your body to adapt to your new nicotine delivery method. Smoking whilst simultaneously vaping, may give the user an undesired flavour, or an unfulfilled craving when vaping. When a user stops smoking, their sense of taste and sense of smell would tend to perform better over time, and thus making vaping a more sensational and pleasant experience. Cravings may still develop during the transition to vaping for a cigarette, some users may switch temporarily to a higher nicotine content to counter this effect, and reduce this level once their cigarette cravings have been controlled. Vaping may initially tend to cause some users an initial dry throat upon usage, which can be alleviated by simply increasing their regular intake of fresh water during the transition process over a few weeks, if you feel the effect is still lingering on, you may have to decide whether vaping is suitable for you and seek guidance from a physician, but generally if any users experience this effect. It is only a temporary effect during the initial transition process. Think about it like this: the sooner you make the switch the better off your health would be and the sooner your body and lungs can start to recover, if you have decided to stop smoking, by switching over to vaping you will cease to stop dumping harmful chemicals from smoking traditional tobacco cigarettes like Tar, Carbon Monoxide, Arsenic, Lead and Cyanide. Your wallet gets fatter in the meantime as well as the fact you will save a lot more money. With the prices of cigarettes ever increasing, £9.00 on average for a pack of 20 cigarettes these days, is more than any reason for most people to switch over! • 1 out of every 5 deaths is caused by tobacco. • Tobacco is responsible for 440,000 US deaths every single year. • Residential fires caused by smoking are responsible for nearly 1,000 fire-related deaths and 3,300 injuries each year. • Tobacco smoke contains more than 4,000 chemical compounds including carbon monoxide, ammonia, formaldehyde, and other poisons. 4 of the chemicals – benzene, 2-naphthylamine, 4-aminobiphenyl, and polonium-210 are classified by the EPA as known carcinogens—cancer causing agents. • Tobacco is responsible for the majority of all cancers of the lung, larynx, trachea, oesophagus and bronchus. • Tobacco can cause serious cardiovascular and pulmonary diseases. • Smoking tobacco is also known to produce cancer in the pancreas, kidney, bladder, and the cervix. • Tobacco reduces blood flow and has been proven to cause impotency. • Smoking during pregnancy increases the risk of miscarriage and foetal growth retardation. It also causes about 5-6% of prenatal deaths, 17-26% of low-birth-weight births, and 7-10% of pre-term deliveries. • Women account for 39% of all smoking deaths. • Smoking cost the US over $150 billion annually in health care. • A study published in the New England Journal of Medicine found that non-smokers exposed to second-hand smoke were 25 percent more likely to have coronary heart diseases compared to non-smokers not exposed to smoke. • 3,000 non-smoking adults die of diseases caused by exposure to second hand smoke every year. • Second-hand smoke causes coughing, phlegm, chest discomfort and reduced lung function in non-smokers. • Children exposed to second-hand smoke at home are more likely to have middle-ear disease and reduced lung function. • 2 to 5 million US children suffer from asthma; of these, about 20 percent experience more asthma attacks and more severe attacks than their fellow young asthmatics, due to second-hand smoke. • The EPA has classified second-hand smoke as a carcinogen since 1992. • According to the EPA, approximately 50-75 percent of children in the United States have detectable levels of cotinine, the breakdown product of nicotine, in their blood. We do not promote our products as smoking cessation devices, but gathering the feedback from our customers, our products are having a positive impact on people’s lives, their health and their wealth all for the better! We promote our electronic cigarette products simply as an alternative to traditional tobacco smoking. Numerous customers having used our products have advised us that they have successfully stopped smoking traditional tobacco cigarettes, which is a fantastic achievement for them. The numerical figures and data to corroborate any claims have not been fully researched by any independent authority to allow us to scientifically state our products will aid a user to stop smoking. However the far and wide positive feedback we have received from our customers, and from many others in the vaping world does signify that there can be some potential benefit for users to switch from smoking to vaping. The Electro Tobacconist is focused to provide you with high quality e-liquid products from suppliers that have undergone MSDS testing, and to supply products which comply with the RoHS Directive 2002/95/EC and its subsequent amendments. The contents and format of the SDS are in accordance with REGULATION (EC) No. 1907/2006, EU Commission, Directive 1999/45/EC, 67/548/EEC. Certification showing tests of e-liquid products are Free from Nitrosamine content. We hope this information was useful to you, and if you haven’t already started vaping, maybe now is the time to do so and for you to turn a new leaf. We would advise you to read the safe usage information below, which we have to notify you of according to FDA regulations as our products may contain nicotine which in its pure form is a known toxic chemical. Nicotine in its pure form is a toxic chemical, so we always need to point this out for your health and safety. However when used safely in conjunction with your electronic cigarette it is non-carcinogenic especially when compared to the carcinogenic effects of traditional tobacco cigarettes. There isn’t a reliable unbiased study available for users. The FDA will overstate the dangers to cover themselves and the Electronic Cigarette industry will understate the dangers to sell their products. While e-cigarettes aren’t dumping tobacco carcinogens into your lungs, nicotine is not considered safe, even though small doses may actively stimulate the body in a positive way, it also speeds across the blood-brain barrier in just a few seconds, is highly addictive, can raise blood pressure, and hurts developing foetuses. It’s always recommended that you quit nicotine all together. Cartridges and bottles of e-liquid may contain nicotine, which in its raw form is classed as a poison. However, e-liquid that is prepared for use in electronic cigarettes is heavily diluted from this high production concentration, and does not present the same danger as nicotine in its raw concentrated form. Nevertheless, e-liquid must be treated with due care and respect. May cause harm to the unborn child – do not use if you are pregnant and/or breastfeeding. It is important to carry batteries properly, charge properly, and dispose of properly. The Electro Tobacconist Limited is not responsible for damage if there is any modification of the batteries/chargers in any form or shape (including pack making). We are not responsible for any damage caused by misuse or mishandling of Li-Ion batteries and chargers. We will not be held responsible or liable for any injury, damage, or defect, permanent or temporary that may be caused by the use of any batteries. By purchasing our products, you agree to use products at your own risk. 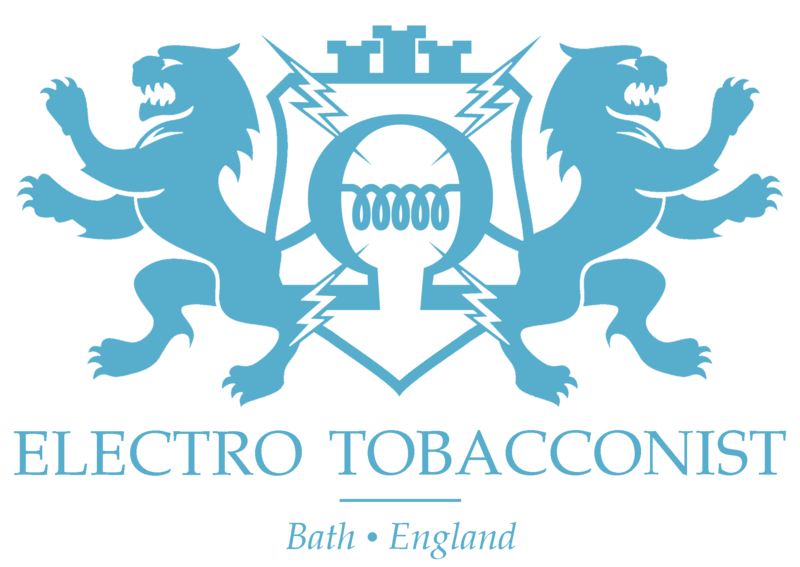 Under no circumstances will The Electro Tobacconist Limited be held responsible or liable, directly or indirectly, for any loss or damage that is caused or alleged to have been caused in connection with use of, or reliance on any product on this site. You must be eighteen (18) years of age, and possess a valid credit card to purchase our products. The Electro Tobacconist Limited will not sell products to minors. The Electro Tobacconist Limited reserves the right to cancel any sales transaction based on its sole discretion where it reasonably believes the purchaser is purchasing products on behalf of a minor.